Registration is now open for Wexford University’s associate of arts degree in Fitness Training for the fall quarter. 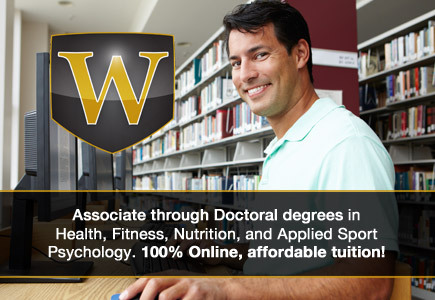 Classes begin Sept. 27 and students can both apply now and register at http://wexford.edu/degree-programs/associate-of-arts-degree-in-fitness-training/. Just in time for fall football, basketball and hockey season, Wexford University has opened up registration for fall quarter for its associate of arts degree in Fitness Training. Wexford’s online associate of arts degree in Fitness Training is designed for anyone interested in becoming a personal trainer, fitness coach, lifestyle consultant or fitness manager and working with athletes at all levels. Online registration for both U.S. and international students is now available at http://wexford.edu/degree-programs/associate-of-arts-degree-in-fitness-training/. The Fitness Training degree and all of Wexford’s other fitness, nutrition and wellness degrees offer flexible and convenient scheduling and self-directed learning for students who are interested in a pursuing a career in a growing field. In addition, Wexford University also offers a bachelor of science degree in Health and Fitness; master of science degree in Nutrition and Exercise; master of arts in Applied Sports Psychology; and a doctor of Applied Sports Psychology degrees. Wexford University’s online associate of arts degree in Fitness Training include classes in Biology, Language Arts, math, Psychology, fitness coaching, anatomy and physiology, nutrition, exercise science, wellness coaching, injury prevention, fitness management and more, and is designed to provide a well-rounded education in fitness training.